Gareth requested Star Wars for his birthday this year. Unlike what feels like everyone and their dog these days, we don't go all out with a birthday theme. Last year we had the cake and some balloons and that was pretty much it. This year a Star Wars cake was not an option, unless we went with a light saber cake because it'd be super easy, but back when we were making decisions about this Gareth didn't seem very impressed by the idea of a light saber cake. So I found some Star Wars cookie cutters on Williams-Sonoma for a great price as well as some gluten-free sugar cookie mix (one of his friends eats gluten-free) and that's as far as our Star Wars theme went. The kids got to decorate the cookies and scarfed them down. Gluten-free apparently works well for baked goods because rice flour is sweeter than wheat flour and so no one notices. The seven year olds at my house Thursday sure didn't. And the cookie cutters worked really well, so we'll definitely use them again. Are they $20 per set of four awesome? Uh, no. But less than half price awesome? Yes. They played, we decorated cookies, they played some more, and then we did ice cream and presents. They got in about ten more minutes of playing before parents started showing up. Gareth had a great time with all his friends and his friends seemed to enjoy it as well. Malcolm refused to nap, of course, so he was grumpy the rest of the afternoon. 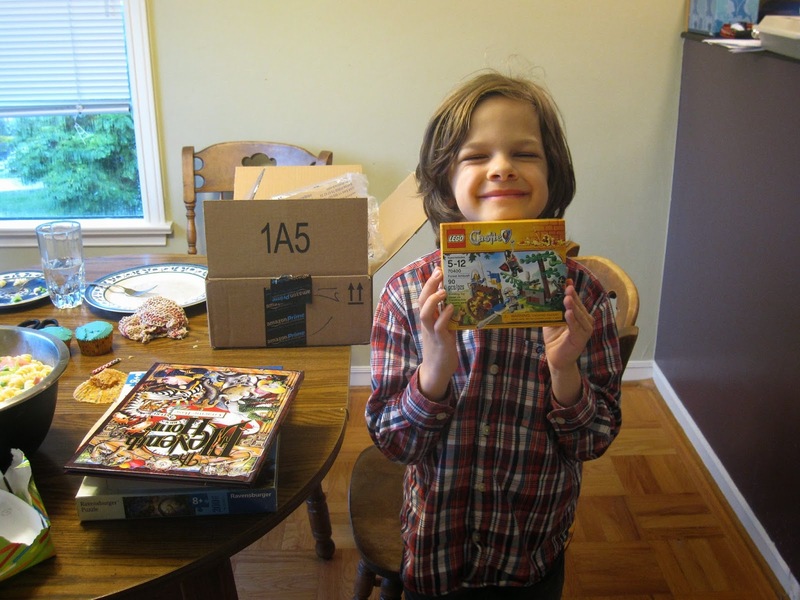 Legos were the popular gift this year (it's what we get all his friends for their birthdays as well), though he did get an ammonite fossil as well, which is pretty cool. For dinner we had his favorite, pasta salad. Dessert was leftover cupcakes from his classroom birthday. We saved family presents for after dinner so Ryan could be part of the birthday celebration as well. 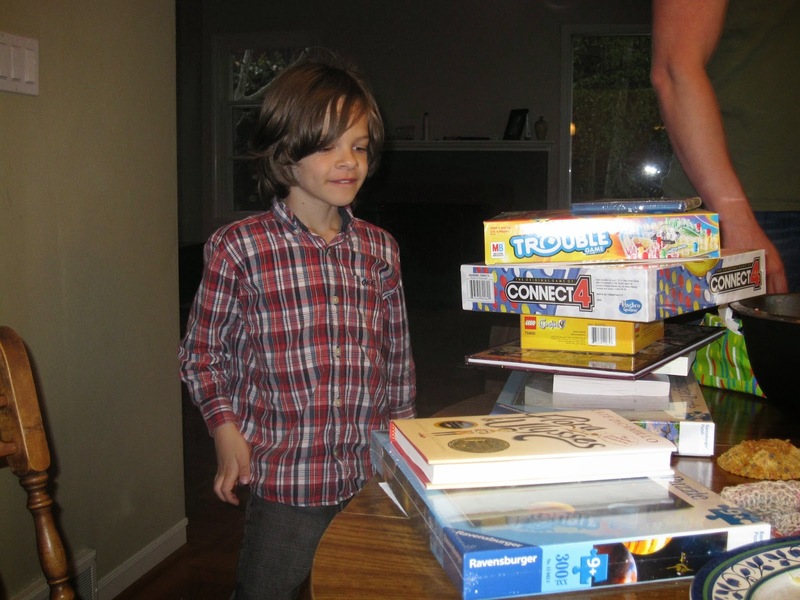 It made a nice change from the Legos of the afternoon (though you can't really have too many Legos, I guess) as he got a lot of books and board games and a couple puzzles. We played all his new games together before he went to bed: Battleship, Connect4, and Trouble, and he carried all his books with him to bed. Gareth at 7 is such a great kid. 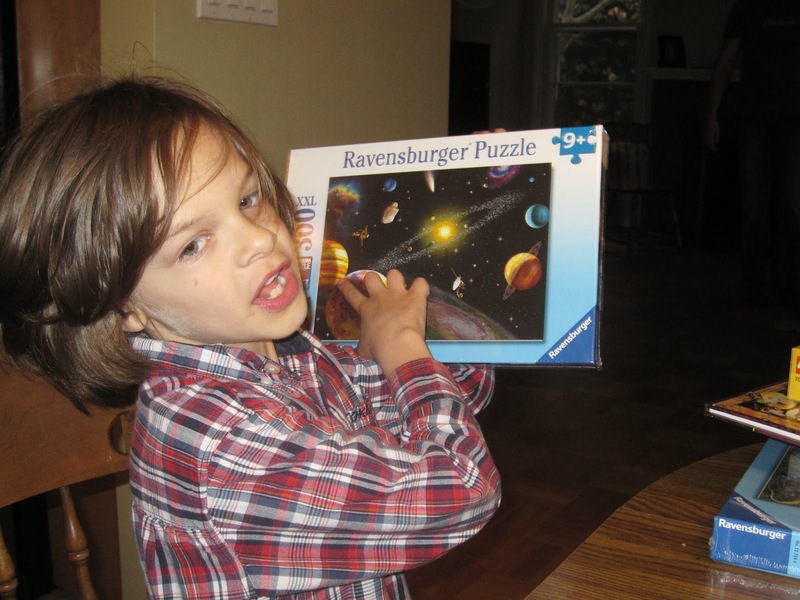 He's excited about so many things, loves reading and video games and is very energetic. He's a superb big brother and is usually more than happy to play with Malcolm. He's generally well-behaved and polite (at least at other people's homes!). It's fun to watch him grow and learn about the world around him. I'm glad I'm not the only one who hates what Pinterest has done to kids' birthday parties! I like your version of having a theme-- much healthier and probably way more fun for the kids, too!